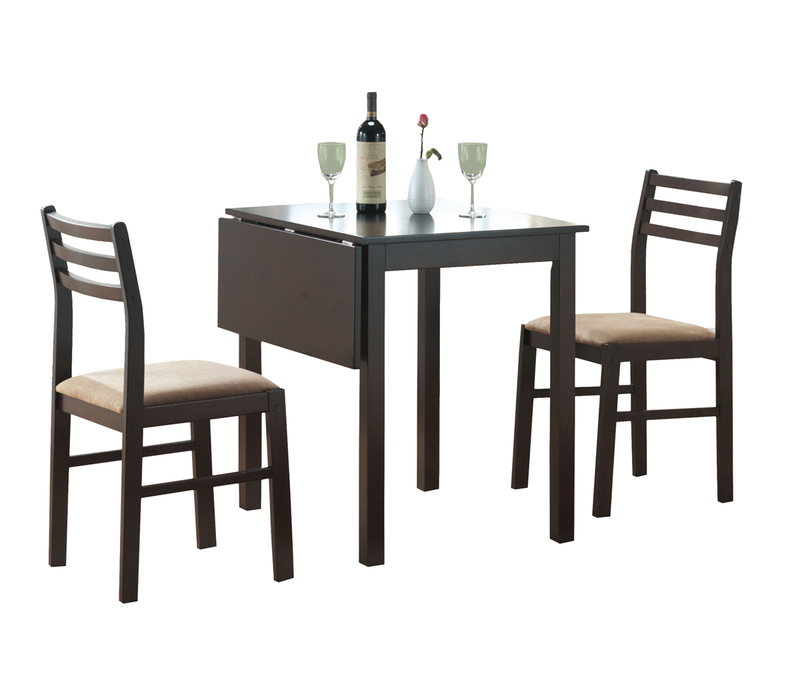 This casual dining set is the perfect solution for small kitchens or dining spaces. The sleek rectangular dining table features tapered square legs that adds a modern appeal. The side chairs have horizontal curved back slats and are upholstered in a padded two tone material. Not only is the bench ideal for small spaces, it concludes the unique and trendy look of this dining ensemble. 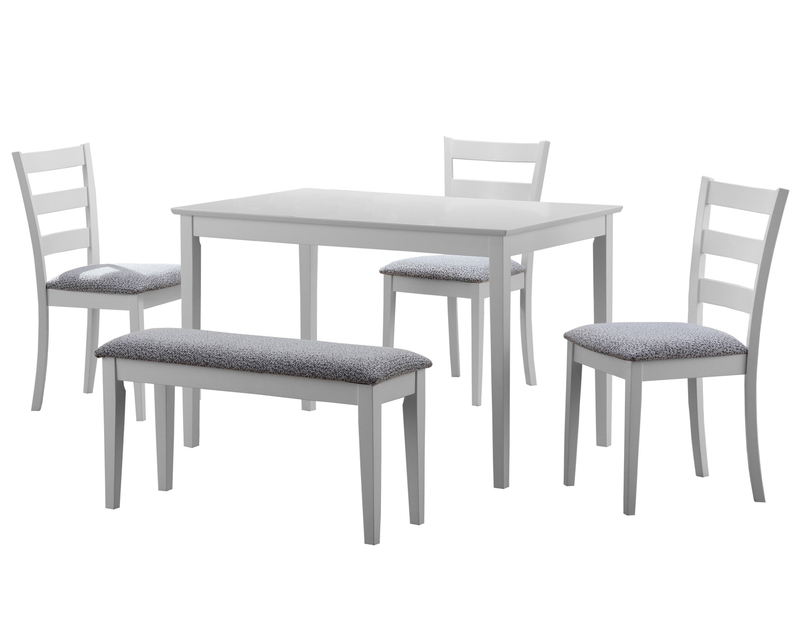 Finished in a crisp white, this cool contemporary five piece dinning set is a great addition to any home or apartment. 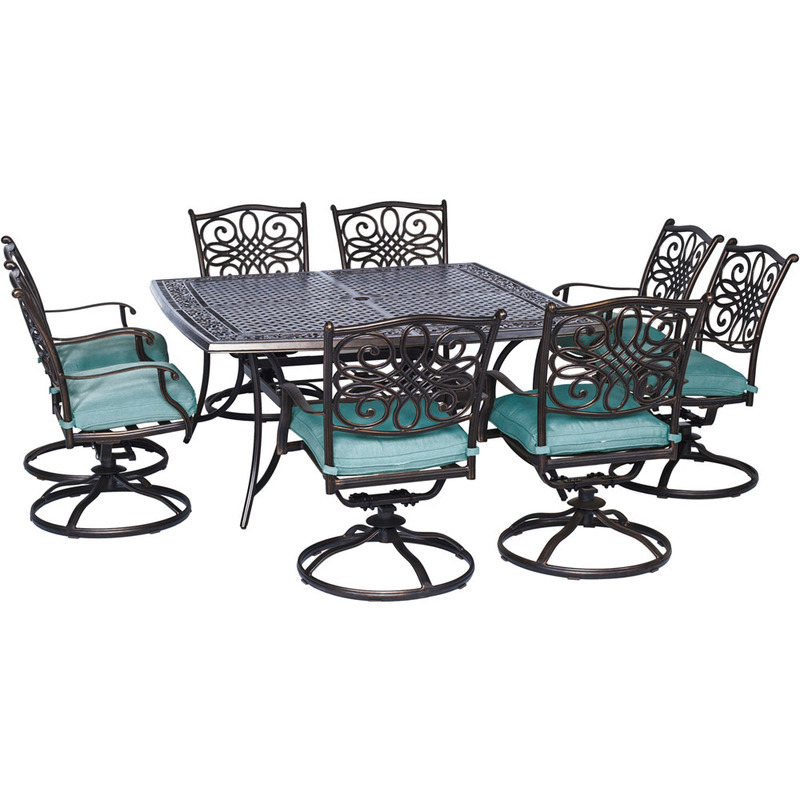 This three piece bistro set offers a classic look that will blend in with any décor. 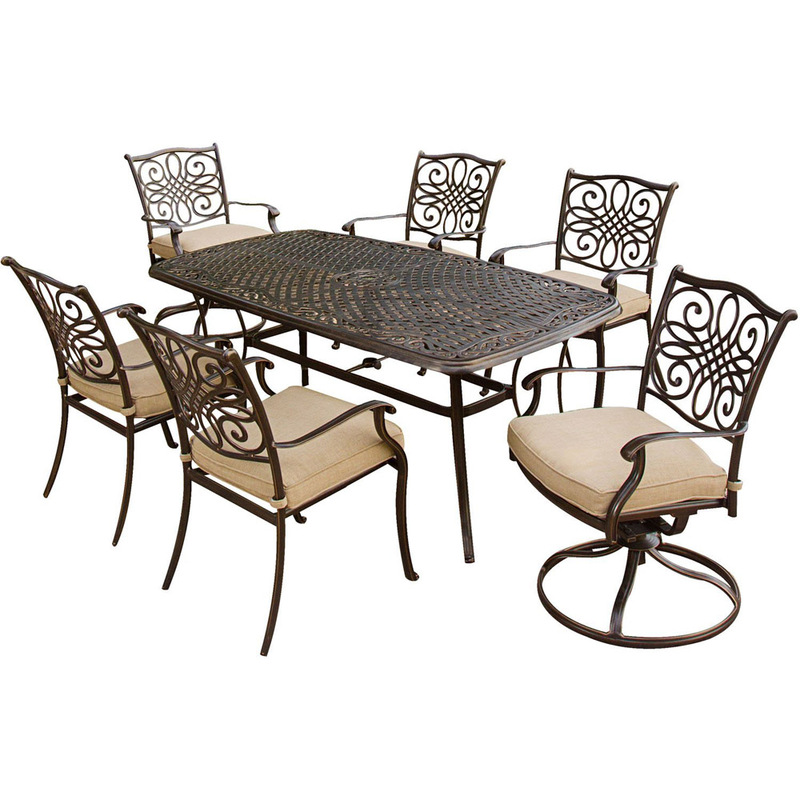 This round table features a solid cappuccino marble-look top, and sturdy bronze metal legs. The armless side chairs feature a circular design and a vertical slat back with cushioned upholstered seating for your comfort. The clean lines of this set will help create a rich ambiance that you and your family will love. 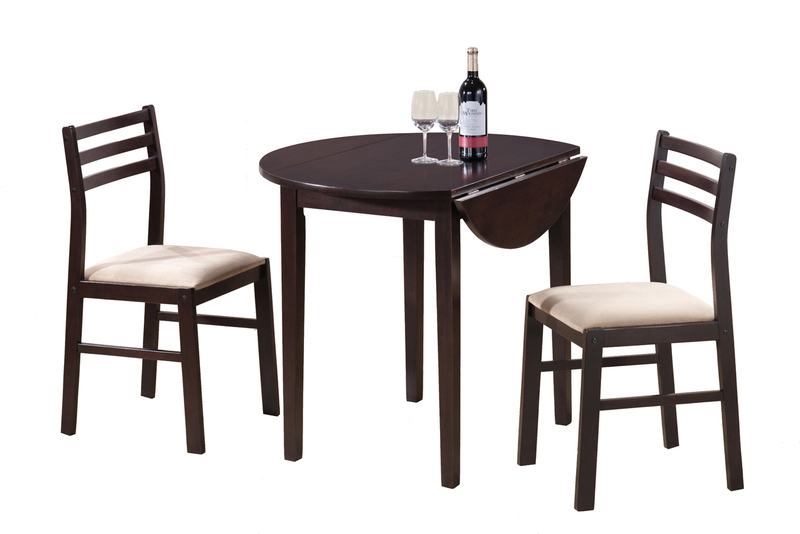 This casual three piece dining set offers a classic styling that will blend in with any décor. This rounded table features a solid-top drop leaf, straight edges and sleek square legs. The armless side chairs feature a ladder back design with padded upholstered seating for comfort. The clean lines of this set paired with a warm cappuccino finish, will help create a timeless look that you and your family will love. 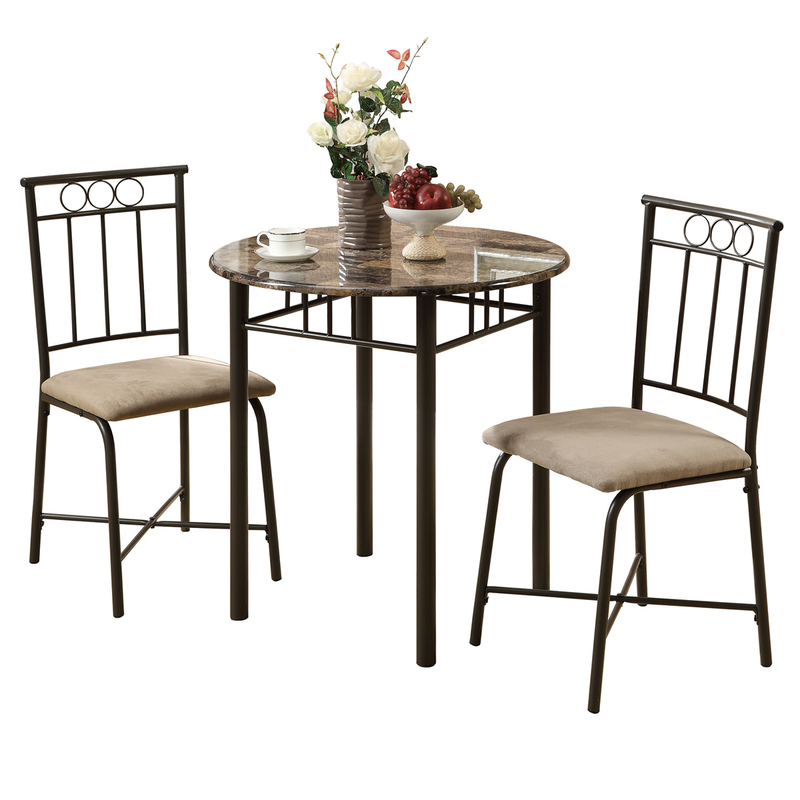 This casual three piece dining set offers classic styling that will blend with any décor. The table features a solid-top drop leaf, straight edges and sleek square legs. The armless side chairs feature a ladder back design with padded upholstered seating for comfort. The clean lines of this set paired with a warm cappuccino finish, will help create a timeless look that you and your family will love. 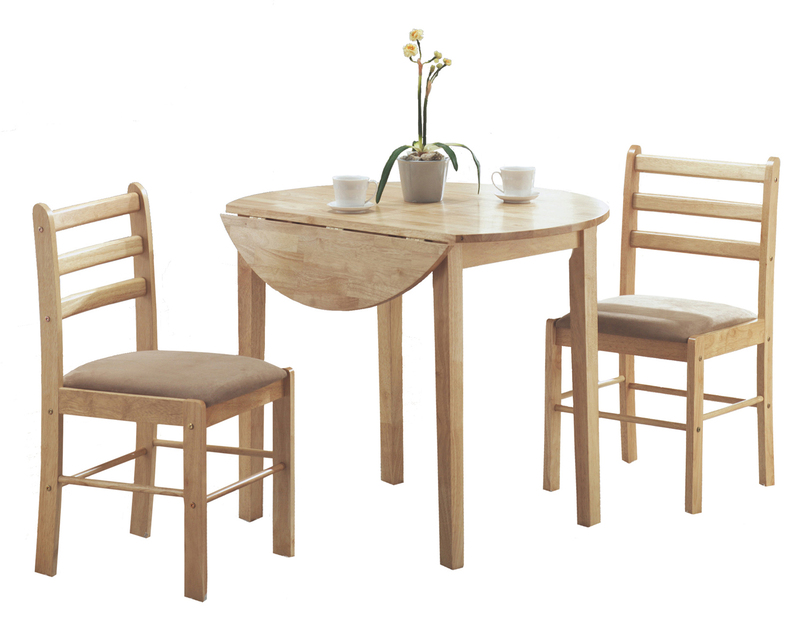 This casual dining set is the perfect solution for small kitchens or dining spaces. The sleek rectangular dining table features tapered square legs that adds a modern appeal. The side chairs have horizontal curved back slats and are upholstered in padded easy care leatherette material. Not only is the bench ideal for small spaces, it concludes the unique and trendy look of this dining ensemble. 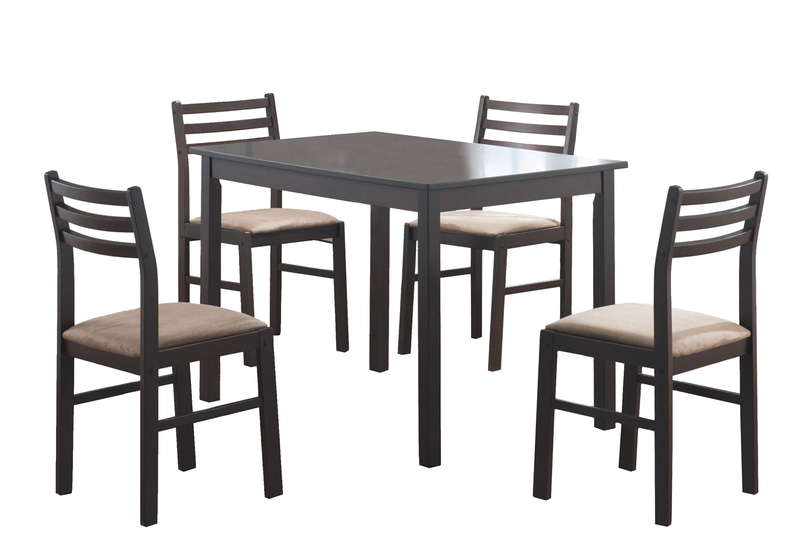 Finished in a dark Cappuccino, this cool contemporary five piece dinning set is a great addition to any home or apartment. 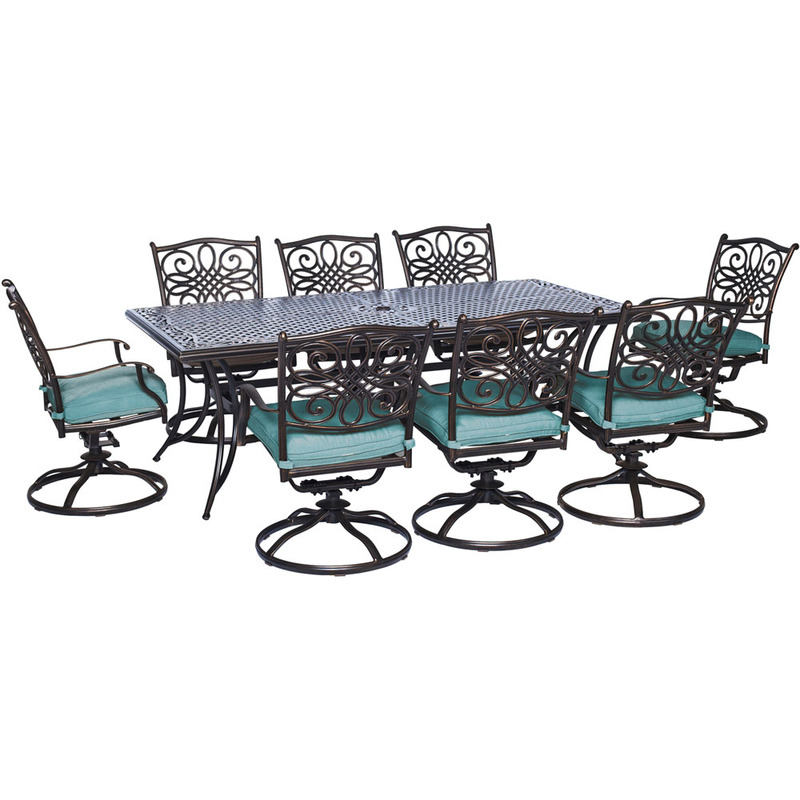 This casual dining set offers classic styling that will blend with any décor. The rectangular table features a solid veneer top, straight edges and sleek square legs in rubberwood. The armless side chairs feature a ladder back design with padded upholstered seating for comfort. The clean lines of this set paired with a warm cappuccino finish, will help create a timeless look that you and your family will love. 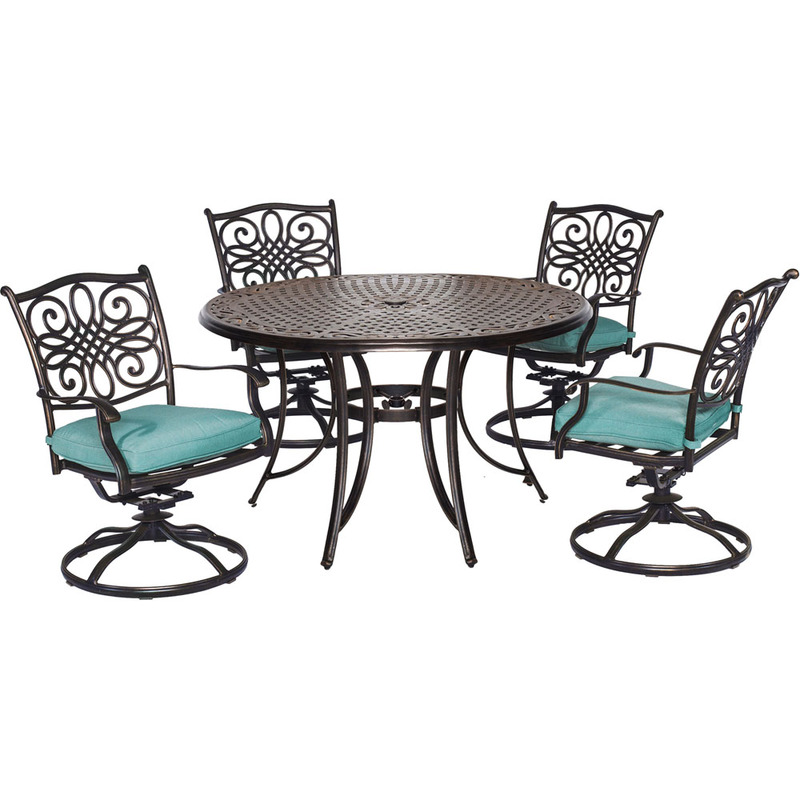 This three piece bistro set offers a classic look that will blend in with any décor. 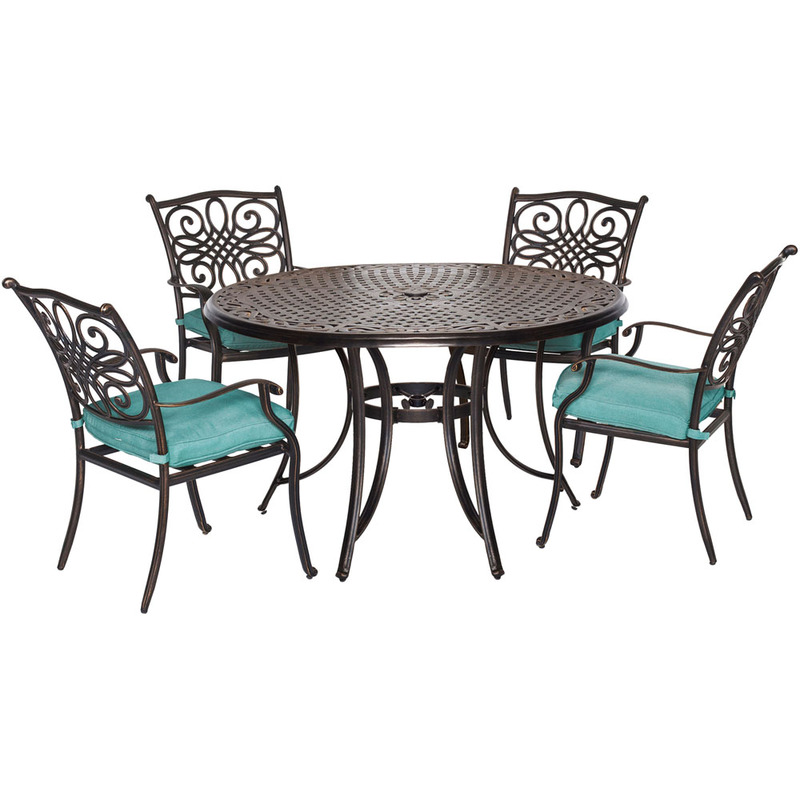 This round table features a solid black top, and sturdy silver metal legs. The armless side chairs feature a horizontal slat back with cushioned and upholstered seats in microfiber, for your comfort. The clean lines of this set will help create a rich ambiance that you will love. 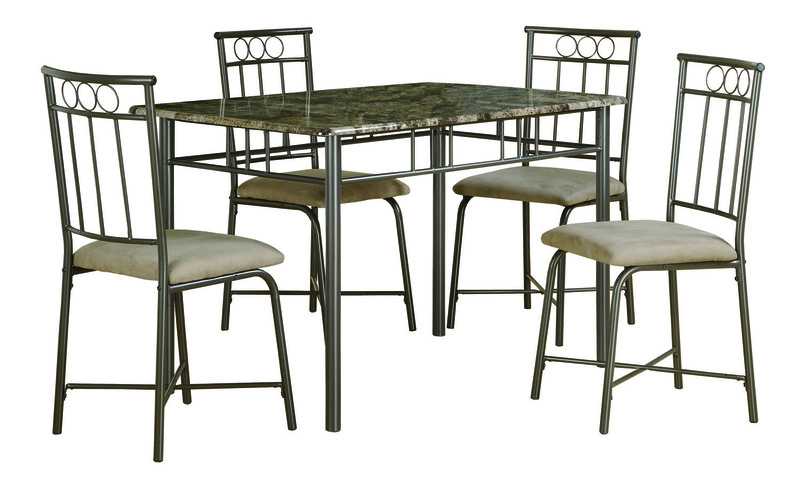 This five piece dining set includes a sleek, cappuccino marble-look table top with bronze tube metal legs and a decorative apron that will bring a touch of style to your home. The chairs that are featured echo the decorative accents of the table and also have vertical slat backs and plush cushion seats for added comfort. 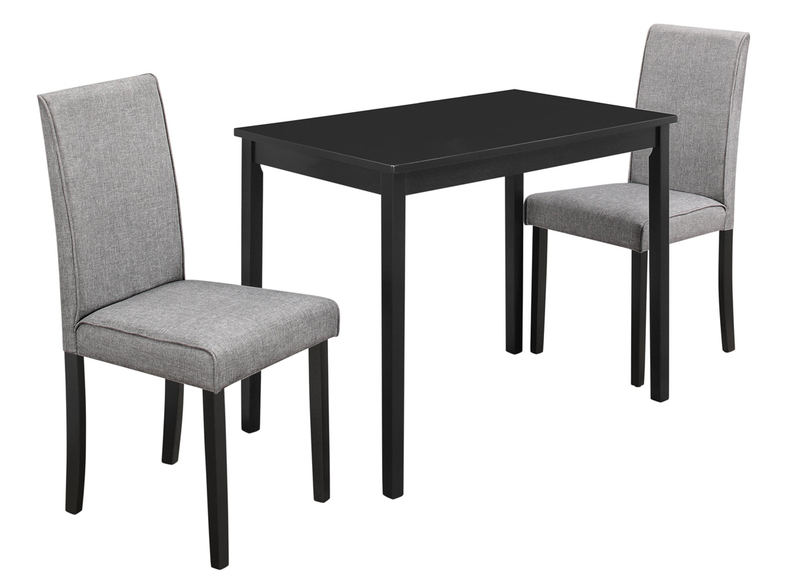 This set is ideal for smaller dining spaces like in apartments and condos. 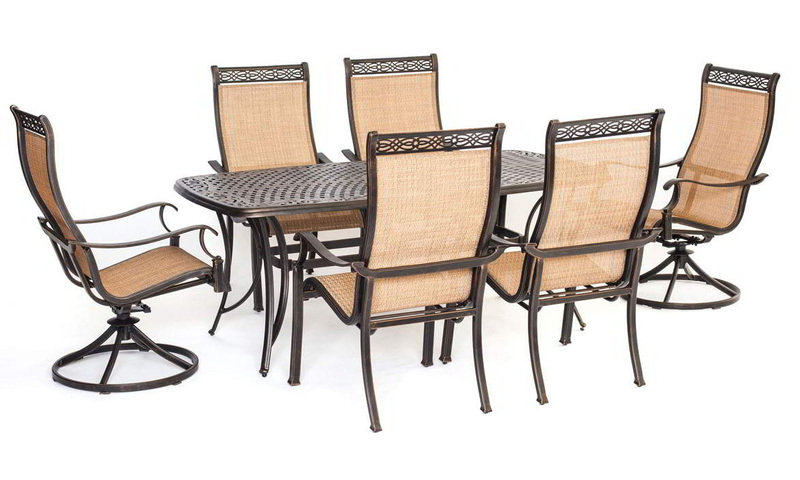 This casual three piece dining set offers a classic look that will blend in with any décor. This rounded table features a solid-top drop leaf, straight edges and tapered solid wood square legs. The armless side chairs feature a ladder back design with padded upholstered seating for comfort. The clean lines of this set paired with a white colored finish, will help create a rich ambiance that you and your family will love. 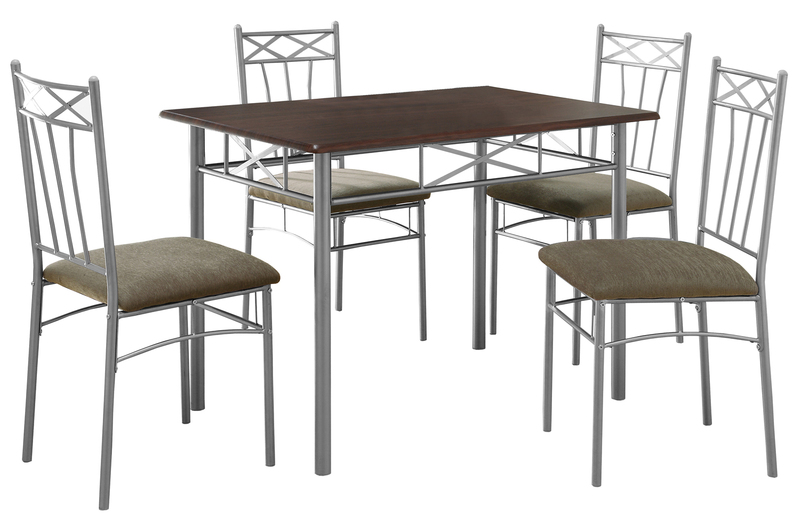 This five piece dining set includes a sleek, cappuccino table with silver tube metal legs and a decorative apron that will bring a touch of style to your home. The chairs that are featured echo the decorative accents of the table and also have plush cushion seats for added comfort. 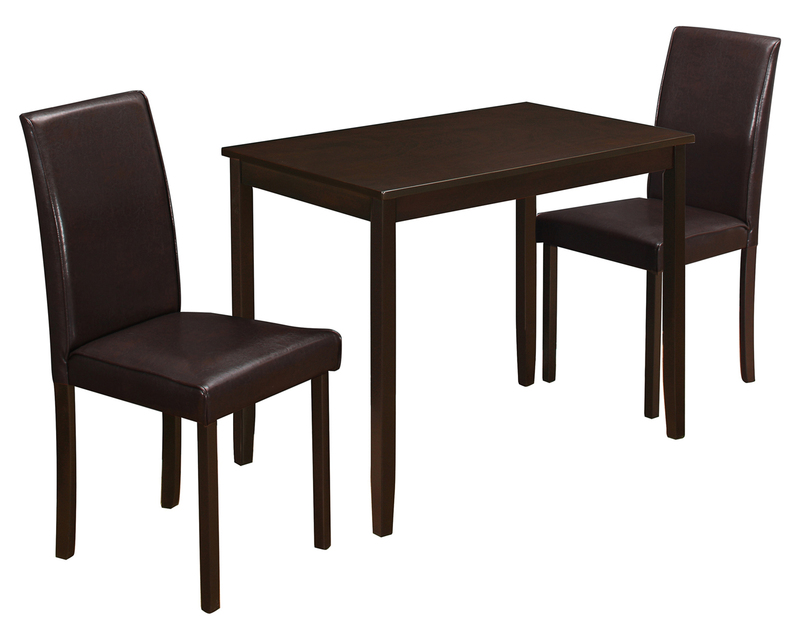 This set is ideal for smaller dining spaces like in apartments and condos. 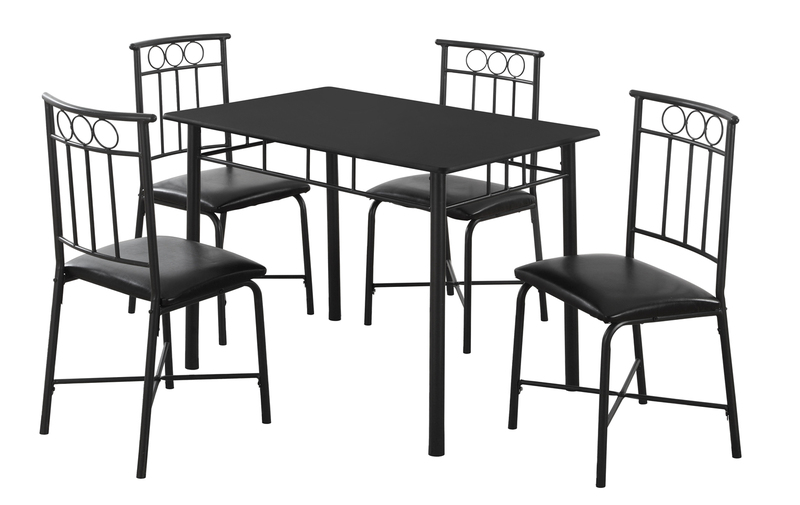 This casual 5 piece dining set finished in black offers classic styling that will blend with any decor. 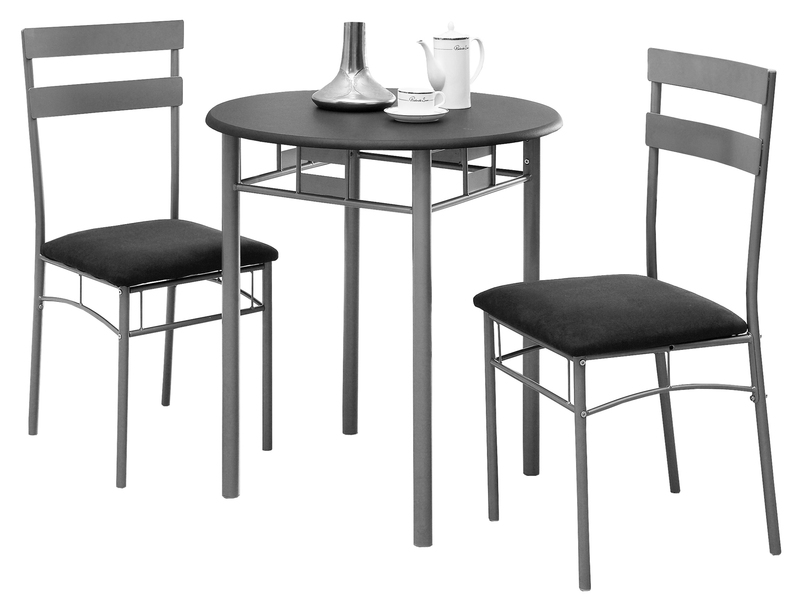 Featuring a rectangle table top with decorative apron, metal tube legs, and matching side chairs, this set will bring a touch of style to your eating area. The armless chairs have comfortably padded seats which are upholstered in an easy care black leather look material. Ideal for smaller spaces, eat in kitchens, condo's or apartments, the timeless look of this set will provide years of lasting enjoyment! 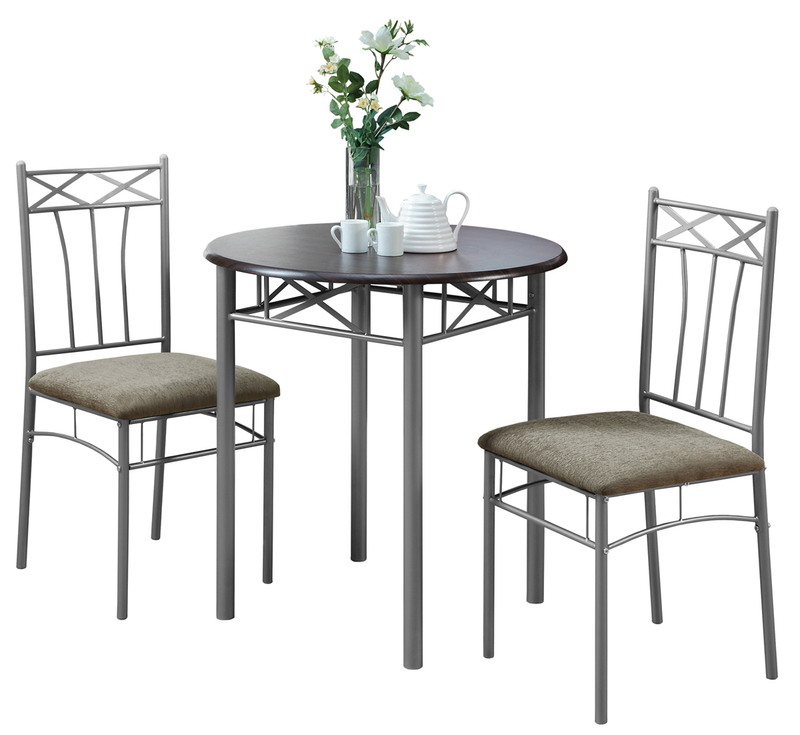 This casual three piece dining set offers a classic styling that will compliment any decor. The round dining table features ample surface area, with. The comfortably padded dining chairs are finished in a rich brown easy to clean leather look material. The simple lines of this dining set paired with a warm cappuccino finish, will help create a timeless look that you and your family will love. 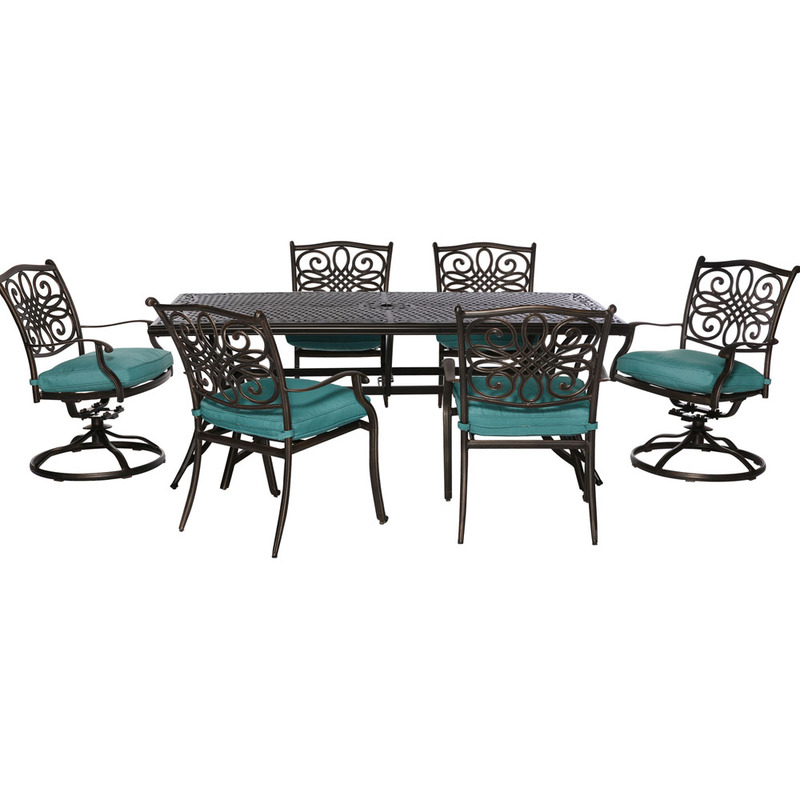 This casual three piece dining set offers a classic look that will blend in with any décor. This rounded table features a solid-top drop leaf, straight edges and sleek square legs. The armless side chairs feature a ladder back design with padded upholstered seating for comfort. The clean lines of this set paired with a natural colored finish, will help create a timeless look that you and your family will love. 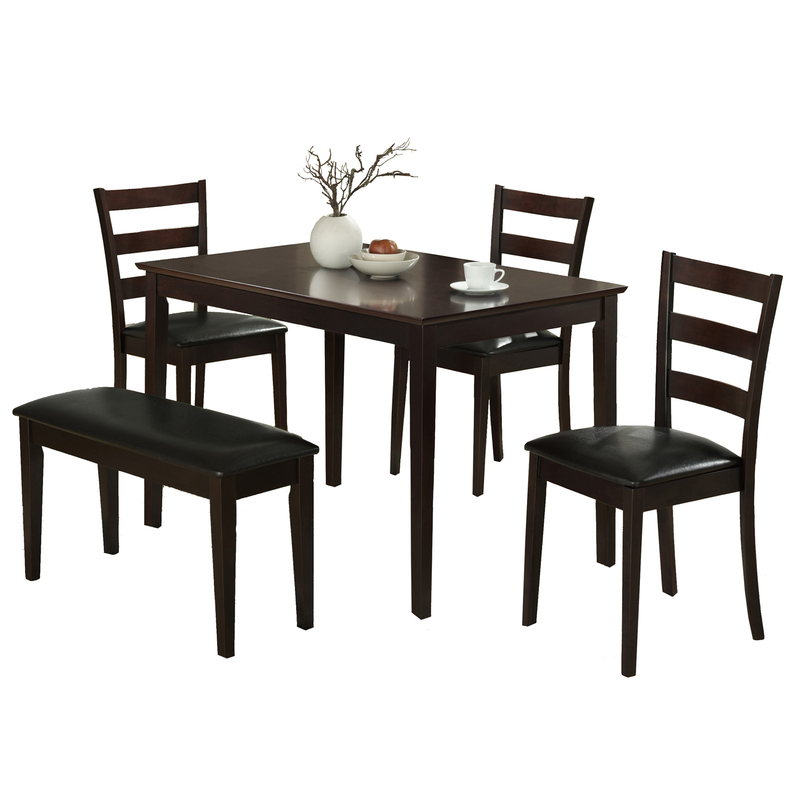 This modern 5 piece dining set will take your casual dining space to a whole new level of chic. 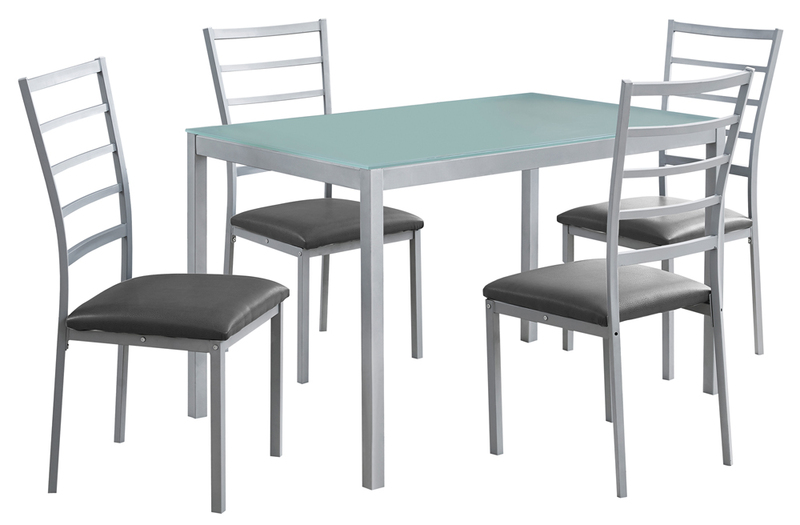 Featuring a rectangular 8mm thick frosted glass top, sleek silver metal legs and 4 matching side chairs, the minimalistic approach of this set will enhance your contemporary decor. The armless chairs featuring a horizontal slat back design, have comfortably padded seats upholstered in an easy care dark grey leather-look material. 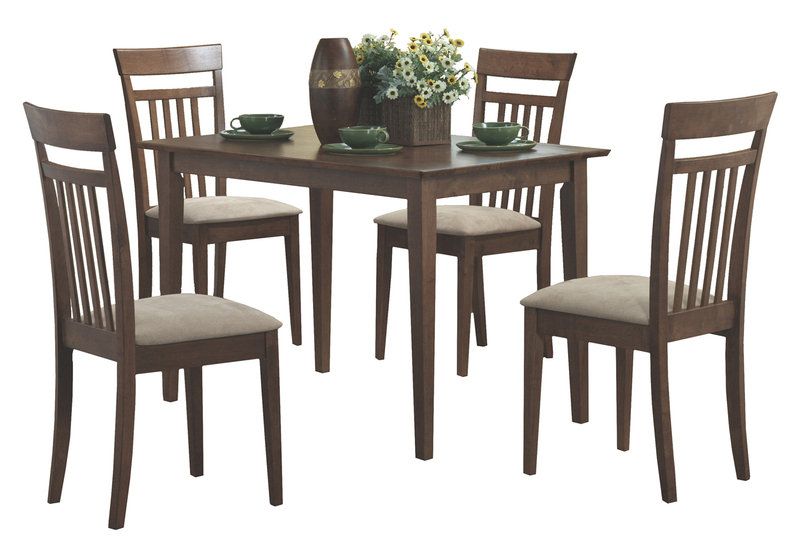 Ideal for smaller spaces, eat in kitchens, condo's or apartments, this dining set is sure to make a statement. Assembly is required. 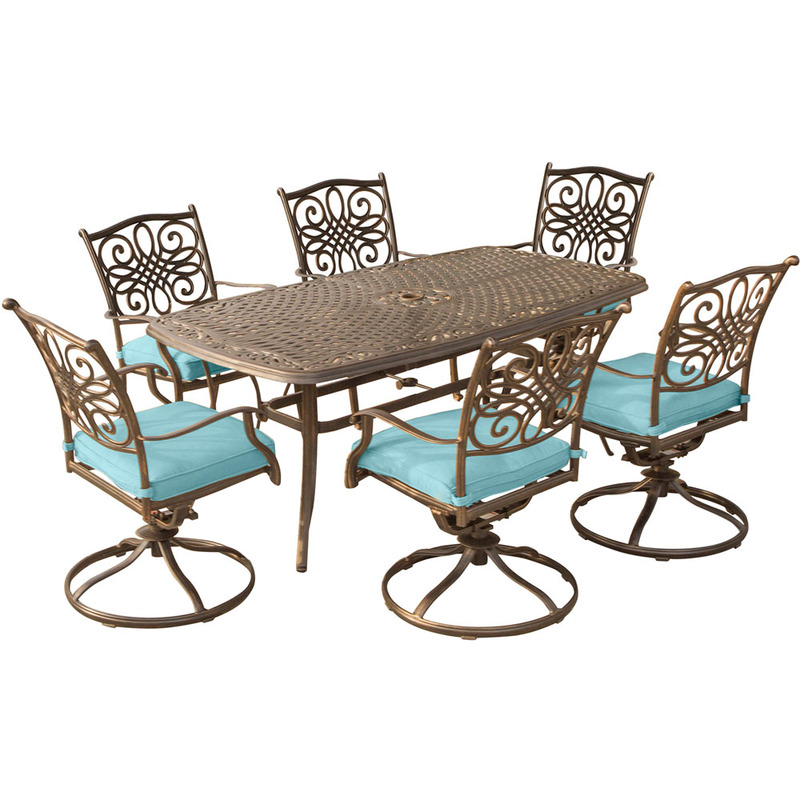 This three piece bistro dining set in a transitional style is perfect for small spaces. 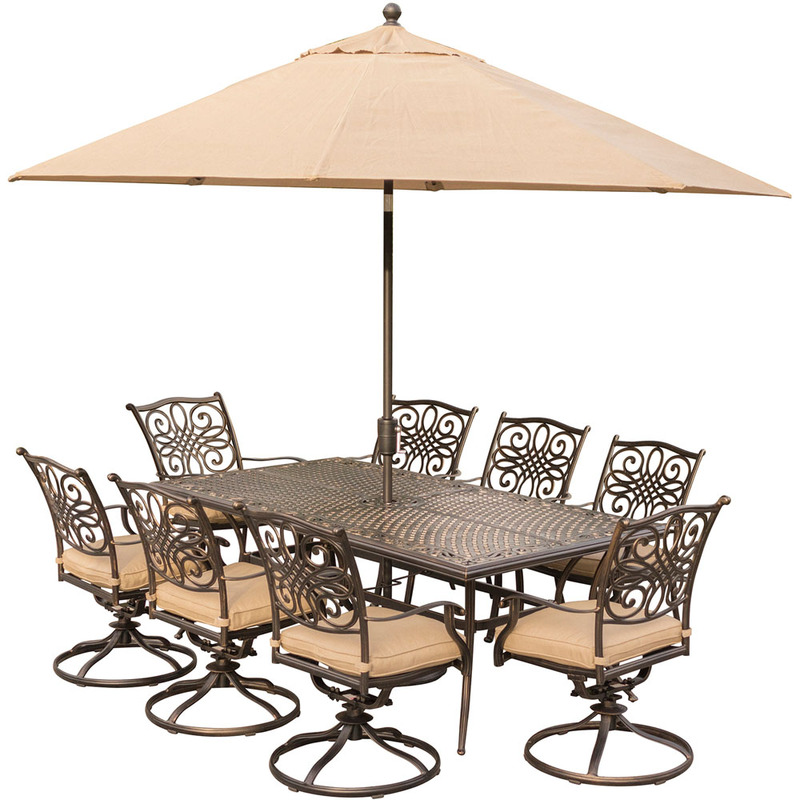 The round table features a smooth black PVC top and sturdy black metal legs. The two armless side chairs are accented with simple circular motifs along the top and a sturdy vertical slat back. The easy-care 2" thick cushioned upholstered seats in a black leather-look material brings added comfort. The clean lines of this 3 piece set creates a cozy ambiance in any dining area whether it's in an apartment, condo, or a small home. 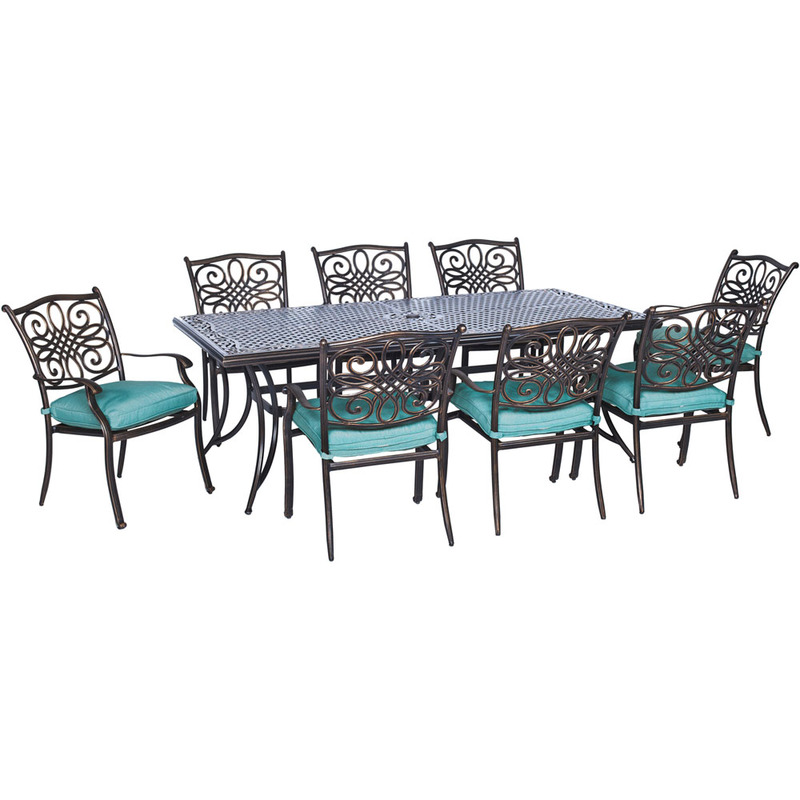 This casual dining set offers classic styling that will blend with any décor. The rectangular table features a solid wood top, straight edges and sleek square tapered legs. The side chairs feature vertical slat backs with padded upholstered seating for comfort. The clean lines of this set paired with a warm walnut finish, will help create a timeless look that you and your family will love. Classic industrial style blends with a chic vintage look to compliment your contemporary dining space. 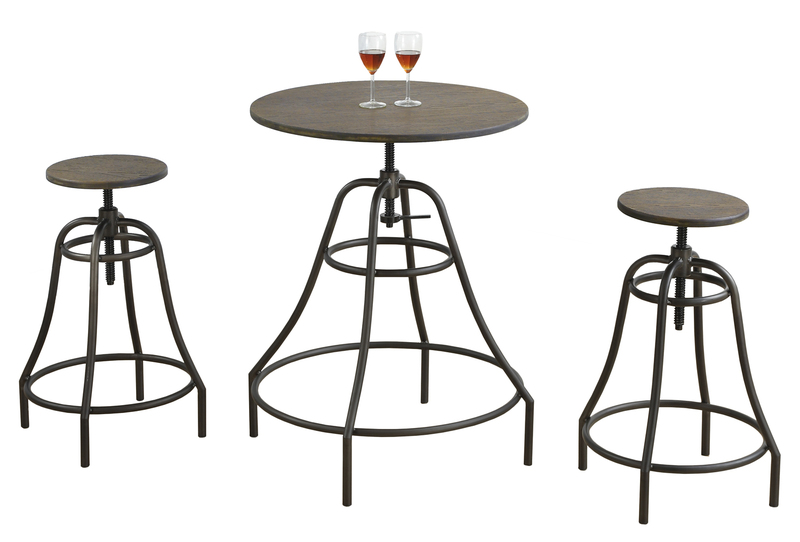 This 3 piece bistro inspired set features a brown distressed-look top, bronze metal tube legs, matching bar stools. 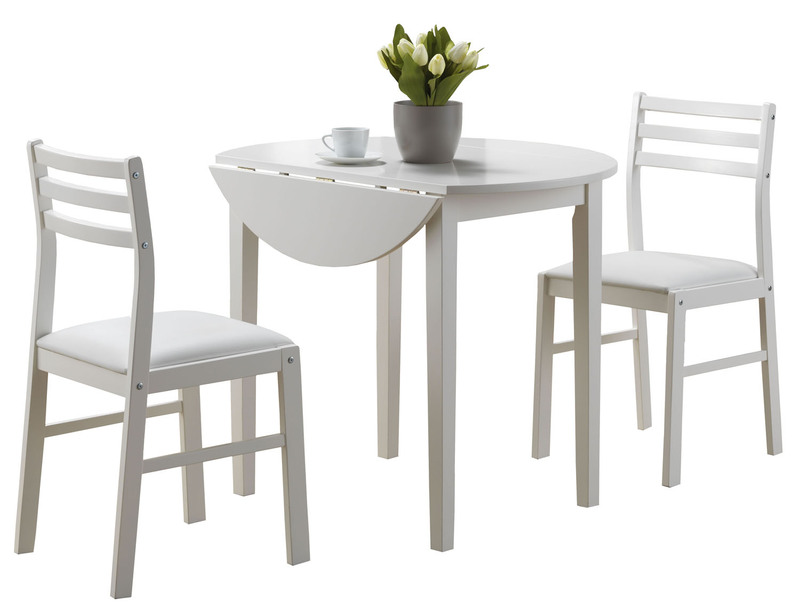 Adjust the height of the table and stools to your desired preference with the unique twist mechanism. Ideal for smaller spaces, lofts, or eat in kitchens this table is must have for any urban household. Seat Height From Floor (inches): 25.5"-33.5"
This casual three piece dining set offers a classic styling that will compliment any decor. Perfect for small spaces, the rectangle dining table features an ample surface area with solid wood legs. The comfortably padded Parsons dining chairs are finished in an elegant and durable grey linen material. 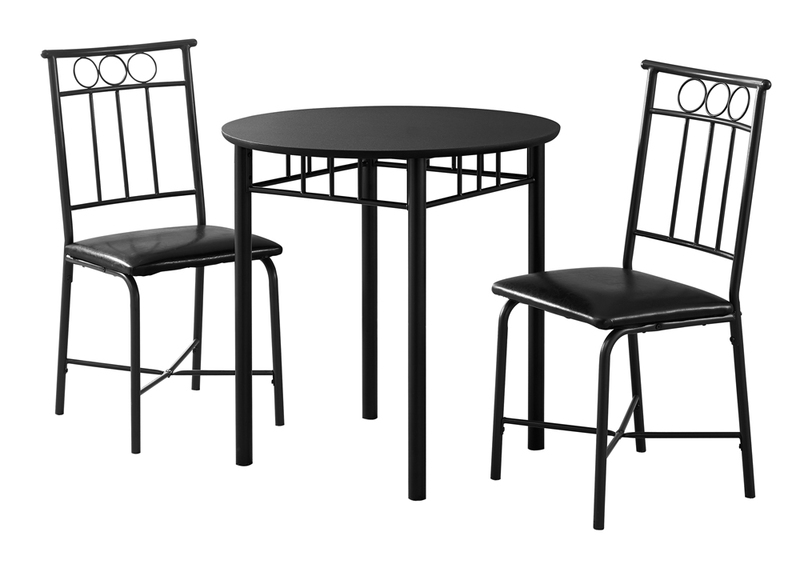 The simple lines of this dining set enveloped with a rich black finish create a timeless look that you will love. 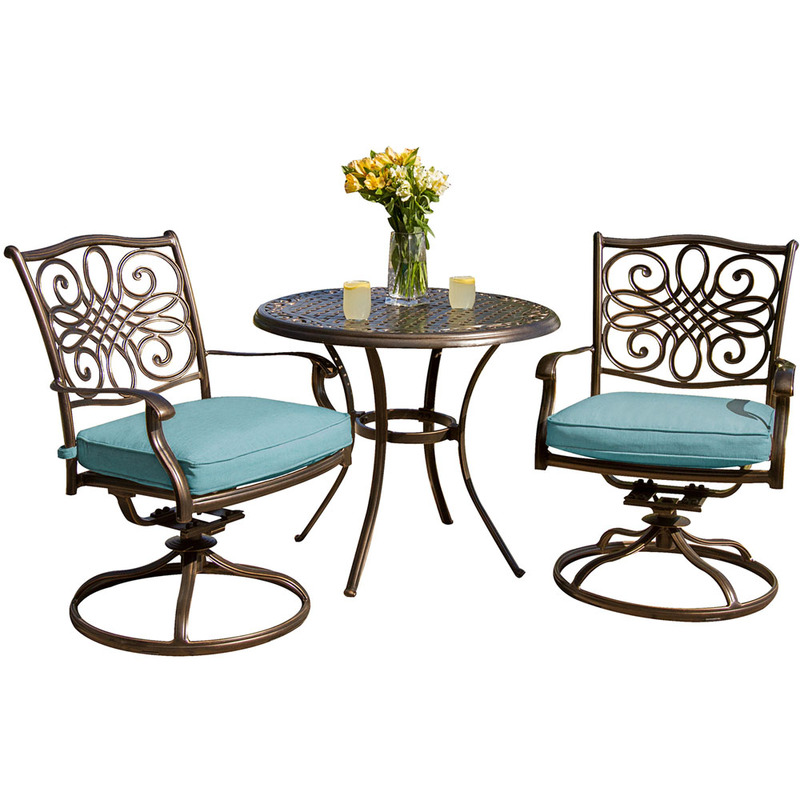 This three piece bistro set offers a classic look that will blend in with any décor. 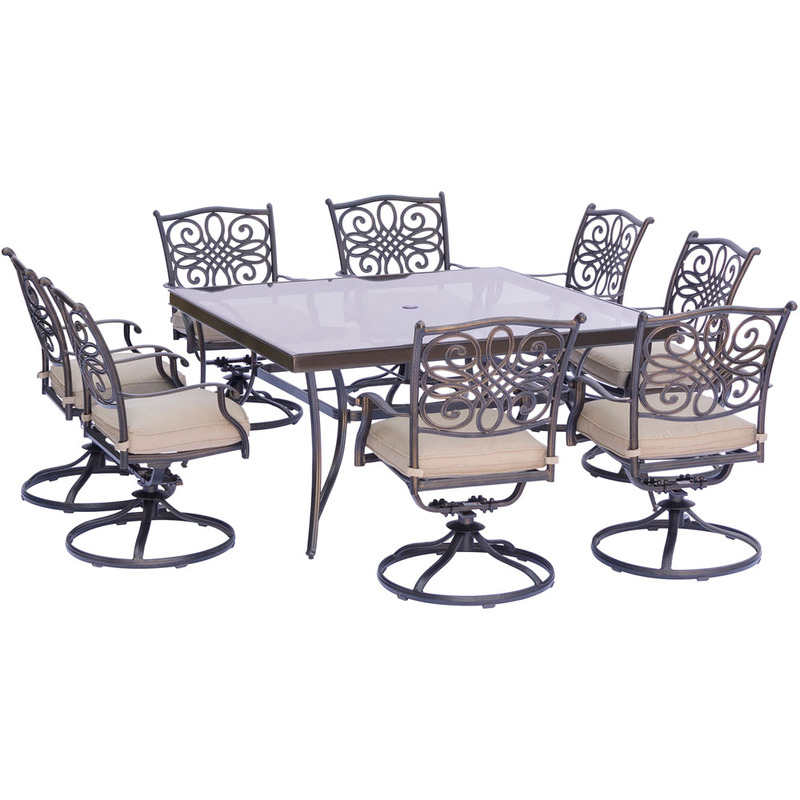 This round table features a cappuccino finished top, and sturdy silver metal legs. The armless side chairs feature a criss-cross design and a vertical slat back with cushioned upholstered seating for comfort. The clean lines of this set will help create a rich ambiance that you will love.